*The Following Colorado and Adams County supplemental forms are included as a courtesy with your order. Are these forms guaranteed to be recordable in Adams County	? Yes. Our form blanks are guaranteed to meet or exceed all formatting requirements set forth by Adams County including margin requirements, content requirements, font and font size requirements. What is the Colorado Quit Claim Deed? Properly executed quitclaim deed documents in the state of Colorado must conform to specific statutory requirements. Valid quitclaim deeds require the name, address, and county of both the grantor and the grantee; the amount of consideration paid for the real property (usually money); a formal legal description and address for the parcel; the assessor's ID number if available; date of execution; and an acknowledged signature of the grantor. See C.R.S. 38-30-113, 114, 116; C.R.S. 38-35-122. In addition, the language in the statutory form should be modified so that "quitclaim" replaces "convey" and "warrant title to the same" is omitted. C.R.S. 38-35-109 governs recording quitclaim deeds in Colorado. After the deed is executed, record it in the office of the county clerk where the land is situated. This preserves the continuous chain of title and allows future prospective owners to review the property's ownership history. Colorado adheres to a "race-notice" recording statute. This means that if a transfer of real property ownership is signed and acknowledged but not entered into the public record by recording, and the original grantor reconveys the same property to another bona fide grantee (someone who purchases the parcel for value, usually money), who then records the quit claim deed, the later grantee generally retains the rights to the property. In short, record the quit claim deed as soon as possible to protect the rights of all parties. 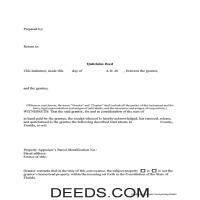 Get your Adams County Quit Claim Deed form done right the first time with Deeds.com Uniform Conveyancing Blanks. At Deeds.com, we understand that your time and money are valuable resources, and we don't want you to face a penalty fee or rejection imposed by a county recorder for submitting nonstandard documents. We constantly review and update our forms to meet rapidly changing state and county recording requirements for roughly 3,500 counties.